C. USE OF PLOTTING BOARD AND COMPUTERS. I. RELATIVE ALTITUDES FOR APPROACH. K. THE THREE BASIC VECTORS OF A NIGHT INTERCEPTION. 1. The Curve of Pursuit Method. 2. The Cut-Off Vector Method. 3. Precautions in Executing the Cut-Off Method. N. CONTROL OF MORE THAN ONE NIGHT FIGHTER. O. TRANSFER OF CONTROL OF NIGHT FIGHTERS. 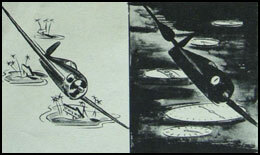 Note: The methods, procedures, and techniques, described in this chapter, for effecting Night Interception with conventional type aircraft, were evolved and proven during World War II. These methods, procedures, and techniques are still effective and will continue to be effective for some time to come. New methods to meet the future requirements for high speed, high altitude type interceptions using jet aircraft are presently being developed. As changes to the existing procedures are adopted they will be promulgated. the bogey and within the operational limits of. its radar gear, the pilot is able to take over and complete the interception. Whereas the day controller is satisfied with giving the day pilot an accurate vector toward the bogey and an estimated altitude, the night controller must be explicit in his direction of the fighter. The confidence of the pilot in the night controller must be absolute, and this is accomplished only where the controller, having accepted the responsibility for the control, has fitted himself for the job. The night controller must be thoroughly familiar with the performance figures for the type aircraft he is to control. He must also know the operational limitations of his ship's radars and the characteristics of the air-borne radar in use at the time. Furthermore, he must be proficient in the use of the abbreviated R/T procedure employed in night air control. 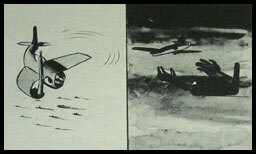 The night controller must at all times maintain positive control of the night fighter, and he must insure that the night fighter does not get within range of friendly ships or bases except during launching and recovery or under special circumstances as directed by the OTC. "(Strictly speaking, positive control means that the controller has radar contact on the plane and two-way communication with the pilot.) The controller must insure that the night fighter is kept clear of navigational hazards such as mountains and fixed obstructionse The pilot should at all times be advised of the proximity of such hazards. In order to insure that safety of flight is maintained, it is mandatory that the controller inform the pilot immediately when the night fighter is not under positive control, and that he is being dead reckoned. When positive control is lost the pilot should be advised to use the facilities at his disposal in order to remain clear of navigational hazards. "(Strictly speaking, positive control means that the controller has radar contact on the plane and two-way communication with the pilot) The controller must insure that the night fighter is kept clear of navigational hazards such as mountains and fixed obstructions. The pilot should at all times be advised of the proximity of such hazards. In order to insure that safety of flight is maintained, it is mandatory that the controller inform the pilot immediately when the night fighter is not under positive control, and that he is being dead reckonede When positive control is lost the pilot should be advised to use the facilities at his disposal in order to remain clear of navigational hazards." 2. read the positions of both intercepting and intercepted aircraft simultaneously on one instrument. It is sometimes advantageous to conduct the initial stages of the interception from search radars, and then shift to microwave sets for the final stages. During the final moments of an interception, the fighter is more easily distinguished from the bogey on the PPI scope of a microwave set. The day controller normally controls his intercepts directly from a PPI scope also, but in some instances a successful day interception can be made from an air plot. Although the night controller controls m rectly from the PPI scope, an accurate jplgjl should be maintained on either a plotting tabta or the DRT. A summary plot of the tactical situation, both air and surface, is mandatory. Instructions to the pilot should be as simple as possible. The pilot should not be required to perform any computaton that can be done for him by CIC For instance, the heading should be given to the pilot as magnetic heading, the speed as indicated air speed, and the altitude as indicated altitude. 1. Fade charts.--Fade chart findings hold true only for bogies at a constant altitude, however. 3. Airborne gear.--The airborne radar will give the fighter's altitude relative to bogey once AI radar contact has been made. 3. Adequate field of visibility for night identification of bogies. 6. Rapid rate of climb. 7. Ability to decelerate quickly. Night fighter aircraft may be either single or multiengined. The usual multiengined plane has greater firepower, carries more fuel and heavier radar gear. However, a single-engined fighter is better suited for carrier operations because of its smaller size. 1. Search.--Used for mapping, intruder missions, and homing. 2. Intercept.--Used in interception, the intercept setting gives range, azimuth, and altitude of the bogey relative to the fighter. 3. Gunsight.--Used in the final moments of an interception, the gunsight setting enables the fighter accurately to close within identification and firing range of the bogey. In low-visibility interception, action is much faster and more instructions are given by the fighter director than during any other form of interception. Because of this, the R/T for low-visibility interception is greatly shortened and very informal. When a night fighter is on the tail of a bogey, the night controller has no time for long call signs or for wordy instructions. Directions must be given as quickly as possible. In general, there are five important transmissions which should be given to the pilot during the approach period of night interception. 1. Pilot is given the original vector plus the phrase. "For bogey." Example: "Mohawk One This is Mohawk. Port zero-seven-zero for bogey. Over." This starts the pilot on the interception at once. 8 It also informs him this is not a patrol vector or drill. 2. Pilot is given indicated air speed and angels to fly. Example: "One. Speed two twenty. Angels ten. Over." 3. Pilot is told the position of the bogey. Example: "One. Bogey northeast thirty. Over." 5. 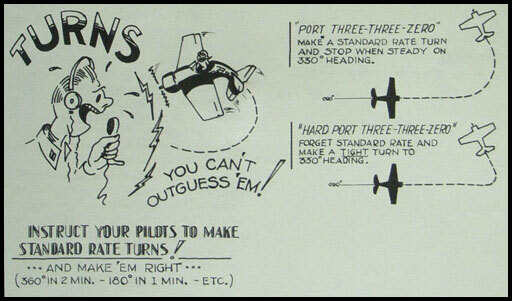 Bogey's heading and indicated air speed are given to pilot. This may take the form of two separate transmissions as very often the heading of the bogey is know before the indicated air speed has been calculated. Example: "One. Bogey heading two-zero-zero, indicating one eighty. Over." The five general transmissions listed may not always be applicable in the above order. The information contained in them should be given as the opportunity arises. "However, the night controller should make at least one radio transmission to the pilot eaoh minute in order to verify communication contact." All orders are always followed by "Over." However, after the safety vector (the vector which is approximately 40° off the target's heading) all information given by the controller is followed by "Out." When giving fighter aircraft a new heading, the controller should always indicate whether the turn should be made to port or starboard. This indication of direction of turn should be given before the heading, for instance: "Port three-four-zero." This enables the pilot to start this turn in the proper direction immediately, even if he fails to understand the vector and finds it necessary to ask for a repeat, lt also obviates the need for the pilot's deciding which way to turn, with consequent delay and possible confusion. 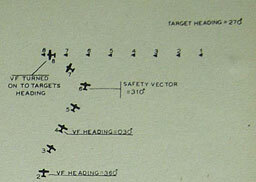 Throughout the interception, the controller should keep the pilot advised of the bogey's position and action in a sort of "running commentary" on the situation. Information passed to the pilot will usually include range, clock-code bearing, direction of flight, bogey's speed, altitude, and any type of evasive action that may be noted. It is reasonable to assume that in the majority of his operations the night controller will have fighter aircraft possessing a definite speed advantage over the bogey, which will ordinarily be a larger and more heavily loaded plane. Use of this advantage should be made at the start of the interception. It is desirable to complete the interception as quickly as possible, and the use of high speed by the fighter is one means of accomplishing this. It is much easier to slow the fighter down in the late stages of an interception than it is to gain speed in an emergency. 10 to 30 knots. Should the fighter be too far behind the bogey for AI radar contact when turned onto course, his speed can be increased until he gets within range. Standard procedure is to direct the fighter 500 feet below and a mile or two astern of the bogey. It is far easier for the fighter to climb up to meet the bogey than to descend upon it from above. If the fighter is placed too high he will have difficulty in descending during the AI radar phase without overshooting. However, the desirable relative altitudes of fighter and bogey will depend on weather and visibility conditions. On a moonlight night, above an overcast, the fighter may prefer to approach from above, thus avoiding the chance of being silhouetted against the fight background of the clouds. If flying below the overcast he will prefer to approach the target from below. The night controller must likewise keep the phase and position of the moon in mind and should direct his fighter in such a way as to avoid approach from a direction that will place him between a brilliant moon and the target. For accurate timing of turns, the standard rate turn (3°/sec.) is prescribed for general use. A hard turn may be used when necessary (6°/sec.). 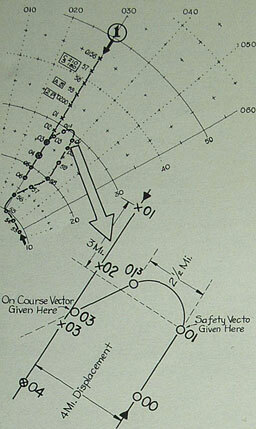 A standard interception consists ideally of three basic vectors: the cut-off vector, the safety vector, and the on-course vector, in that order. directly astern of the bogey on the bogey's course. Figure 112 illustrates the use of these vectors in a standard interception. Probably the three most common methods of interceptions are the curve-of-pursuit method, cut-off vector method and head-on. the bogey. 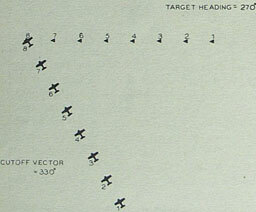 A succession of vectors is given the fighter to keep him constantly on a heading toward the bogey. If the fighter has a speed advantage, he will eventually overtake the target on the proper heading. To execute the curve of pursuit, the controller has only to estimate the compass bearing from fighter to bogey and give this to the fighter as heading. A new heading is given with each change of bearing. As a result the fighter will fly a gradual curve until the bogey is overtaken. New vectors may be given as often as every 10 seconds, resulting in a very steady approach. Figure 113 illustrates the curve-of-pursuit method. The curve-of-pursuit method of interception has disadvantages. It is slow, and therefore time is wasted. Furthermore, it may result in a tail chase unless the fighter has a very considerable speed advantage, and a long tail chase is something definitely to be avoided. Bringing the fighter in 3 or 4 miles behind the bogey may be fatal, for the tail gunner in an enemy bomber, given enough time, may spot the fighter before the latter can close for a kill. Figure 112.--Basic vectors of Might interception. 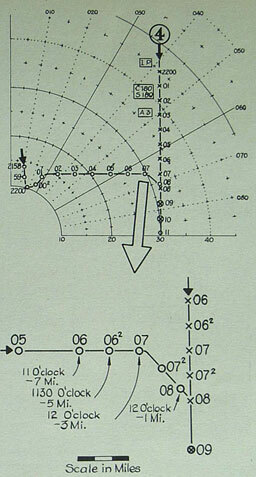 Figure 113.--Curve of pursuit method of interception. This type of interception is accomplished with fighter and bogey travelling at almost equal speeds, the fighter requiring no more than a 10 to 30 knot advantage over the bogey. 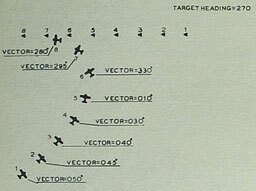 The controller gives his fighter a vector which will cut off the bogey at a point some distance ahead. The controller determines this course on the basis of almost equal speeds. Therefore, given equal speeds, he must send his fighter toward the one point on the bogey's projected track which both fighter and bogey will reach simultaneously. Since the speeds are almost equal, the distance travelled by the fighter and the target will be equal. Thus, set on a collision course, the fighter would meet his target at the apex of an isosceles triangle, as shown in the diagram below (fig. 114). A few miles before this collision point is reached the controller turns his fighter onto a safety vector (40° less than a complete turn onto the bogey's heading). This safety vector is quickly foDowed by a final turn onto the bogey's heading which puts the fighter in the proper position (a mile or two directly astern) for the air-borne radar to make contact. Figure 114. Cut off vector method illustrated. An example of the cut-off method of interception is illustrated in figure 115. 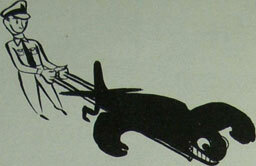 When selecting a cut-off vector, the night controller should bear in mind the danger of putting his night fighter in such a position that a tail chase is necessary. To lessen this possibility, he may give a vector which, if continued, would place the fighter slightly ahead of the bogey- He may, in addition, order the fighter to assume a speed of 10 to 15 knots greater than that of the bogey. 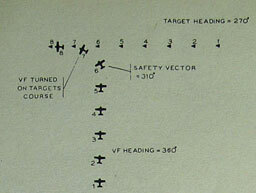 If, as the fighter approaches the position to execute the safety vector, he is too far advanced, he can be directed to the proper position by altering the vector in the direction of the bogey. Roughly 3 miles before the fighter reaches the bogey's projected track (the mileage depending on the distance covered by the fighter's standard rate turn), the fighter is turned onto the safety vector. Finally, a half to three-quarters of a mile from the point where the safety vector would cross the bogey's course, the fighter is turned onto the bogey's heading. The fighter's radar contact should then be immediate if he has not already made a contact on the safety vector.-The precautionary use of a cut-off vector which projects beyond the collision point is illustrated in figure 116. This is probably the most difficult type of interception for the night controller to handle, chiefly because the speed of relative motion of two aircraft approaching each other on reciprocal or nearly reciprocal courses is very great. Consequently, timing of orders must be precise and R/T lag estimated much more accurately than usual. The controller running his first head-on interception is almost invariably astonished at the rapidity with which the two aircraft come together. Flgure 116. Precautionary use of cut-off vector. The generally approved method of handling the head-on interception is to vector the fighter slightly off the reciprocal, allowing 4 miles displacement. This means that there will be an off-set distance of 4 miles between the bogey's projected track and that of the fighter at the time the latter is turned. 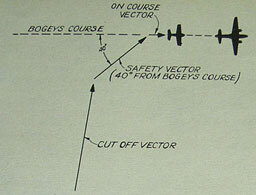 When the fighter reaches a point approximately 5 miles away from the bogey, he is turned to a new course 40° off the bogey's course and crossing the bogey's track. This new heading is the same as the safety vector in the cut-off method and is followed by a turn onto the bogey's heading at the proper place. Figure 117.--Head-on interception, high relative speed. Figure 118.--A head-on night interception. to shorten the tail chase and to avoid the tail warning set in the bandit. | It also may be necessary to have the night fighter turn off his IFF when within 10 to 15 miles of the bandit to prevent the latter from picking up the IFF signal. 0155--Controller: "Mohawk Fifteen-Two. This is Mohawk. Starboard zero-three-zero for bogey. Over." VF: "This is Mohawk Fifteen-Two. Starboard zero-three-zero for bogey. Out." Controller: "Two. Speed two twenty. Angels seven point five. Over." VF: "Speed two twenty. Angels seven point five. Out." Controller: "Two. Bogey northeast 32. Over." VF: "Steady. At Angels. Out." Controller: "Two, Starboard zero-five-zero. Over." Controller: "Two. Bogey eleven o'clock, twenty-eight. Over." 0157--Controller: "Two. Bogey heading two-one-zero, indicating one eighty. Over." 0158--Controller: "Two. Port zero-three-zero, Over." Controller: "Bogey eleven o'clock, eighteen. Over." Controller: "Bogey eight thousand. Your angels Okay? Over." 0159--Controller: "Two bogeys eleven o'clock, fifteen. Over." Controller: "Bogey eleven o'clock, twelve. Over." Controller: "Throttle back twenty. Over." VF: "Throttle back, twenty. Out." 0200--Controller: "Bogey eleven o'clock, eight, Over." 0201--Controller: "Two, port two-four-zero. Over." 0201--Controller: "Bogey twelve o'clock, three, crossing. Punch. Over." Controller: "Bogey one o'clock, two. Out." 0202--Controller: "Bogey twelve thirty, one and a half. Out." 0203--Controller: Port two-one-zero, bogey's heading. Over." 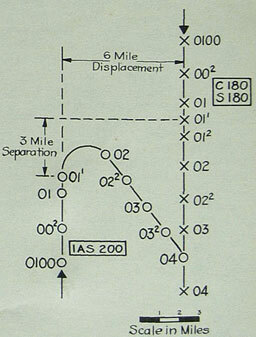 Figure 119.--Large displacement in a head-on raid. Displacement is the distance between the bogey's projected track and the fighter's position when it commences to turn. A displacement of 3 to 6 miles allows for the fighter's turning diameter, avoids enemy air-borne radar and gives the night controller maneuvering room. In a head-on raid 4 miles should separate fighter from bogey when the turn is given. In a jinking raid, 5 to 6 miles is allowed. Factors influencing the amount of displacement are the fighter's turning diameter, the presence or absence of enemy jinking, and the ability of the enemy to detect the fighter either electronically or visually. (a) Light conditions.--When time allows, the fighter should be given the advantage of having the bogey silhouetted against what light there is in the sky. (b) Position of the base.--If there is an otherwise equal choice of side for displacement, the side toward the base might well be chosen. If the enemy turns toward the base, the gain is evident; if he turns away, there is still time for the development of the interpection. 0100-- At this time the bogey is one o'clock ten miles. The six miles displacement is usually considered too much. 0101--Controller: "Two. Starboard zero-nine-zero, Over." Controller: "Two. Bogey eleven thirty, four and one half. Over." 0102--Controller: "Two. Starboard one-two-zero, Over." 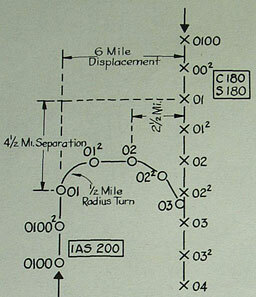 Figure 120--Sample a head-on raid employing the standard 40° safety vector and three mile separation. Controller: "Bogey twelve o'clock. Two. Crossing to starboard. Punch. Over." VF: "Punch. Steady one-two-zero. Out." Controller: "Bogey twelve o'clock one and a half. Out." 0103--Controller: "Two. Starboard one-eight-zero, Bogey's heading. Over." FD: "Bogey twelve o'clock, one. Out." The procedures to follow in dealing with a crossing raid are illustrated and set forth in the following diagrams. 2200--Controller: "Mohawk Fifteen-Two. This is Mohawk. ; Port-zero-four-zero for bogey. Over." VF: "This is Mohawk Fifteen-Two. Port-zero-four-zero. Out." Controller: "Two. Speed two twenty. Angels five. Over." VF: "This is Two. Speed two twenty, at Angels five." Controller: "Two. Bogey northeast thirty-five. Over." VF: "Roger. Out." 2201--Controller: "Two. Starboard zero-nine-zero Over." Controller: "Two. Bogey heading one-eight-zero, indicating one-eighty. Over." VF: "Roger. Steady zero-nine-zero. Out." Controller: "Two. Bogey ten o'clock, thirty. Out." 2202--Controller: "Two. Angels two point five, Over." VF: "Angels two point five. Out." Controller: "Two. Bogey three thousand. Over." Controller: "Two. Single bogey, eleven o'clock, twenty. Over." Controller: "Two. Bogey heading one-eight-zero, indicating one eighty. Over." VF: "Roger. At Angels. Out." 2204--Controller: "Two. Bogey eleven o'clock sixteen. Over." 0411--Controller: "Two. Bogey eleven o'clock, One. Out." Controller: "Two. Starboard one-eight-zero bogey's heading. Over." 0329--Controller: "Fifteen-Two. Bogey eleven o'clock. Nine. Over." 0330--Controller: "Two. Starboard one-eight-troller: zero. Bogey's heading. Over." Controller: "Two. Hard starboard two-seven-zero. Over." VF: "Hard starboard two-seven zero. Out." Controller: "Bogey six o'clock. One. Over." 0332--Controller: "Two. Hard port zero-nine-zero, Over." VF: "Hard port zero-nine-zero. Out." Controller: "Two. Starboard one-two-zero. Over." Controller: "Bogey eleven thirty. Two. Punch. Over." 0333--Controller: "Two, Starboard one-five-zero, Over." Controller: "Bogey eleven thirty. One and one half. Over." 0333--Controller: "Two. Starboard one-eight-zero, Bogey's heading. Over." VF: "Contact twelve o'clock. Three quarters. Out." 0329--Controller: "Fifteen-Two. Bogey eleven thirty. Nine. Over." 0330--Controller: "Two. Starboard one-eight-zero, Bogey's heading. Over." Controller: "Two. Bogey twelve o'clock, one. Over." Controller: "Two. Speed one eighty. Over." Controller: "Two. Make "S" turns. Over." VF: "Make "S" turns. Out." 0331--Controller: "Two. Starboard two-two-zero, Over." Controller: "Two. Bogey nine o'clock. Out." 0332--Controller: "Two. Port one-four-zero. Over." Controller: "Two. Bogey eleven o'clock one and one half. Over." Controller: "Bogey twelve o'clock. One. Over." 0333--Controller: " Two. Starboard one-eight-zero, Bogey's heading. Over." Controller: "Bogey twelve o'clock. One Over." VF: "No joy. Weapon bent. Over." Controller: "Speed two hundred. Try for a visual. Over." VF: "Speed two hundred. Out." the night fighter in an orbit between the enemy plane and base to await further developments. When the weave is encountered, the fighter director can either follow the zigzag course turn for turn or have his fighter fly a mean straight heading along the middle path of the weave at some reduction in speed. This will enable him to get AI contact during the time the bogey is crossing the mean course on one of the legs of his weave. When the bogey spirals while it also climbs or dives, care must be taken that the fighter does not overshoot the bogey. Successful interception will depend on the controller's anticipating the dive or climb at the time the fighter moves within normal AI radar range. The abrupt reduction of speed is used by the enemy to cause the fighter to overshoot. The best counteraction is to vector the fighter off the course at a sharp angle, then turn him back onto course. Naturally all these methods of combatting evasive action are dependent on the tactical situation at the time. Although generally only one plane is directed by one night controller, several planes can be controlled by one man, or from one base, by intensification of teamwork, accurate status keeping, and the briefest R/T. Simultaneous raids should be treated as separate interceptions. Even if an incoming raid is but a single plane, it may be well to have a second plane in the area to take over the shoot-down if radar, guns or communications of the first plane are ineffective. It is not unusual for several bases to control the fighter during the course of a single interception. This transfer of control must be accomplished with a minimum of delay. The pilot need not know more than the call of the controlling base, the shift being announced to him only by the use of a new call. The flow of information between bases should be continuous, and one base should be ready to take over from another whenever necessary.